This is a vintage Bodo Hennig kitchen. The accessories on the counter are a mixture of Bodo Hennig, Re-Ment, Lil Bratz and Irwin. 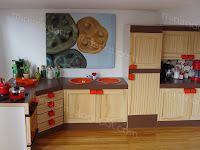 The art above the sink is from the Kaleidoscope House accessories. 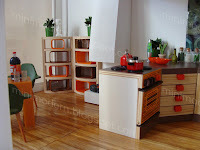 The chairs are Reac, the table is AG Minis and the shelving unit is a mixture of Plan Toys and Re-Ment. It just occurred to me while putting this mini scene together that I have had the red Bodo Hennig kettle and pot (on the stove) since I was about 10 years old. On the route to where I attended school, there was a German butcher who's wife sold Bodo Hennig dollhouse items in the corner of the shop. Yeah, those two things don't really go together but they made it work at least for a little while because they are no longer there. I remember the woman was very very suspicious of me and watched me like a hawk because I would come by almost every day to look at the miniatures and never buy anything. Some days I was alone and other days I would bring friends. Eventually she learned that I was no threat and warmed up to me. When I bought the kettle, she gave me the pot for free. I wonder where she is now. Have a question for you....where did you get the doll miniature with child? Looks really cool! I've got exactly this kitchen yesterday. It seems a little bit too big for my dollhouse, but you show me, that it is possible to make a modern scene with it in 1:12, so I will try too.